This will be the first case report to highlight clinical thinking and rationale combined with the progression and results of physical therapy treatment for a 13 year old with Parsonage-Turner Syndrome. 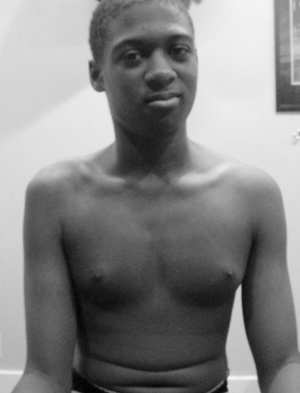 A 13-year-old African-American male initiated physical therapy services after a referral from an orthopaedic surgeon due to right shoulder instability. Upon subsequent physical examination by a physical therapist, the combination of significant strength deficits, substantial atrophy and no pain complaints led to further questioning. 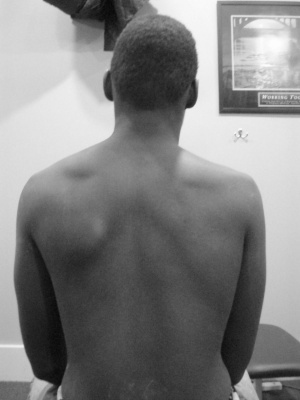 The young patient reported severe right shoulder pain approximately 4 weeks prior to the visit and contributed the symptoms to attempting to perform a push up in gym class. Upon further questioning, his parent reported an upper respiratory infection and severe neck pain approximately 4 weeks prior to the push up incident. Neither the current presentation nor the reported history were consistent with typical shoulder instability. The physical therapist recommended a referral to a physiatrist for further diagnostic testing. Electromyography and nerve conduction studies indicated neuralgic amyotrophy. Neuralgic amytrophy (NA), also known as Parsonage-Turner Syndrome or brachial plexus neuropathy, is quite rare with an annual incidence rate from 1 to 3 cases per 100,000 population.1,2 Onset age is usually in the 2nd or 3rd decade, but can have a range from neonatal to the 7th decade. Although patients with NA are referred to physical therapists, literature is substantially lacking in what physical therapy interventions are beneficial. The majority of literature focuses on diagnosis and etiology. Lack of anticipated progression is found within current published literature. This will be the first case report to highlight clinical thinking and rationale combined with the progression and results of physical therapy treatment. 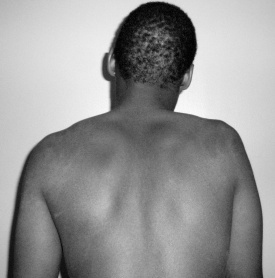 A 13-year-old right-handed African-American reported injuring his right shoulder while doing a push up in gym class. At that time he had substantial pain and for a couple of days was unable to use his right upper extremity. When his parent observed he wasn't using his right upper extremity normally, she sought the services of the primary care physician. Based on the reported mechanism of injury and the amount of laxity, the patient was referred for an orthopaedic consult. He was referred for physical therapy services due to right shoulder laxity. The adolescent denied pain and numbness or tingling. He reported a 50% deficit in function. The PF-10 score was 70/100. Upon palpating his shoulder, I immediately knew something was not normal. This patient's shoulder didn't feel as would be expected. I asked the patient to disrobe so I could better have a better understanding of what I was palpating. It seemed that my fingers could easily sink to the humerus on his involved side. After he disrobed, this is what I observed. He had substantial atrophy of his right shoulder muscles. He demonstrated poor ability to elevate the right shoulder. Actively, he was only able to demonstrate approximately 140 degrees of flexion and 120 degrees of abduction on his first attempt. Measuring the active motion proved to be difficult due to compensatory patterns and fatigue. Multiple repetitions of assessment led to less elevation and more compensatory patterns. He reported no pain with active range of motion. Passively, in the supine position, he had normal, pain free range of motion of the involved shoulder (right). Grip strength assessed performing 3 trials with a hand dynamometer indicated a grip strength of an average of 79 pounds on the non-dominant non-involved side and 50 pounds on the dominant involved side. Based on the preliminary findings, the atypical presentation did not match what would be expected with joint laxity. I questioned the parent for additional information. The parent denied any recent immunization(s) or any recent antibiotics. The family had not been on vacation or out of the country. The parent confirmed that 4 weeks prior to the push up scenario her son had an episode of extreme neck pain, swollen lymph nodes and an upper respiratory infection. She said those symptoms seemed to resolve within a few days. Unfortunately, the familial history for the adolescent was unknown because he was adopted. Because the patient was adopted, I had no familial history to help me determine if his presentation was the result of some type of progressive muscular type of disease process or a peripheral nerve injury. I recommended the adolescent have a consult with a physiatrist. I needed further diagnostic testing to help determine if some type of peripheral nerve damage was due to a viral infection or if there was some genetic reason for the significant amount of muscle atrophy. The patient was basically on hold with physical therapy services for 4 weeks as he progressed through the medical system due to the need for differential diagnosis. I was unsure how to proceed without a reasonable diagnosis that could help with determining physical therapy interventions and progressing the patient to have optimal outcomes. The patient returned for physical therapy services 4 weeks later with a more specific diagnosis. Electromyography indicated that the patient had neuralgic amytrophy (NA), also known as Parsonage-Turner Syndrome or brachial plexus neuropathy. The working diagnosis of NA seemed consistent with the initial presentation. Although he had not received any physical therapy services or advice during the 4 weeks, he showed improvement in his presentation. 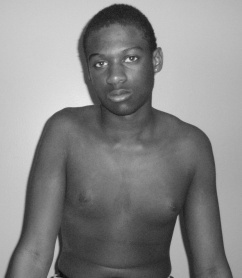 He continued to have atrophy but the right upper extremity muscles were beginning to have more definition. Active range of motion of the right shoulder improved to 160 degrees of flexion and 180 degrees of abduction. He was actually able to perform 1 set of 6 repetitions of full abduction before he exhibited fatigue and compensatory movement. Right grip strength assessed by the hand dynamometer had improved to an average of 66.67 pounds. Based on the changes that happened over the natural course of his condition during the previous 4 weeks consisting of no intervention, I was hopeful about the chance for positive outcomes. The diagnosis now pointed me in a direction to help develop a treatment plan. The diagnosis also created a problem. Upon searching for answers for this patient, all I had was that nerves had undergone injury due to the virus and were regenerating. I could not find any research to support any specific intervention for an adolescent. Based on my clinical experience and based on what I thought about nerves and muscles, two main concepts in my head: I needed to challenge the muscles to improve strength and create hypertrophy while at the same time not overchallenge the healing nerves. I also knew that the healing nerves may not be functioning quite normally and that neuromuscular electrical stimulation (NMES) may be a helpful component to add to the treatment plan. Because the nerves were not denervated, I chose to focus on AC current as the source for neuromuscular electrical stimulation. Throughout this patient's episode of care, I focused on challenging muscles to improve strength, while at the same time not allowing the patient to experience a significant amount of upper extremity fatigue. A key component of the home exercise program was NMES. I vended a NMES rental unit to the patient (300 PV an Empi product). A variety of preprogrammed options are available on most rental units as with this unit. The preprogrammed setting that seemed to best meet this patient’s needs was PPR4. 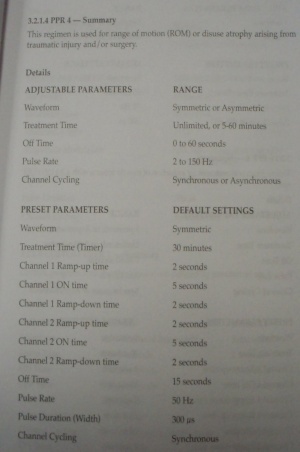 The intensity was to create a motor contraction response and the parameters were as indicated below. I recommended that the patient utilize the device twice a day for 30 minutes each session. During each session, the lateral deltoid would be stimulated for 15 minutes and then the next 15 minutes would be spent on stimulating the shoulder flexors (anterior deltoid and biceps). Only two electrical stimulation electrodes were required to achieve adequate stimulation. I recommended an intensity of motor stimulation indicated by obvious muscle twitching. While the unit was stimulating, the patient performed isometric contractions of either shoulder abduction or shoulder flexion. I advised no more than 1 hour of fatigue after exercise. His home exercise program was verbally monitored. When the isometrics seemed easy and no fatigue was noted after the session, resisted exercises were performed with NMES. After 20 days of resistance included in his home exercise program, he began having issues with being overly fatigued. Concurrently he began having lateral cervical pain and some shoulder pain. The home program was changed to using NMES while performing 10 repetitions each of shoulder flexion and shoulder abduction versus 15 minutes with each activity. The change accommodated his symptoms. The patient adhered to his home exercise program. Eight weeks after initiating the home exercise program with the NMES, the patient began using Techrod2 at home. This is a resistive exercise machine the patient had in the home. 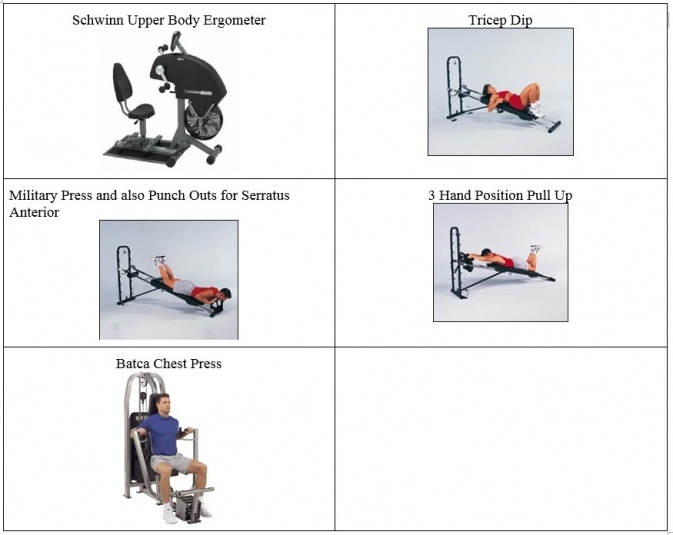 Resistive exercise program performed at home included alternate arm curls, triceps, single strap pull, shoulder press, chest press, punch outs while on chest press, shoulder flexion and shoulder abduction. Clinic sessions consisted of strengthening exercises for the upper extremity. The patient attended 2 times per week. Duration of appointments was on average 30 minutes. Initially the patient required multiple rest periods due to fatigue. Initially I had to be highly observant and recommended when to rest based on performance. By the 15th appointment visit the patient was becoming more independent and more likely to suggest rest intervals. The general exercises provided in the clinic included strengthening on these pieces of equipment. Seven weeks after beginning physical therapy services, you can see the change in the patient's ability to elevate his involved upper extremity. Strength and endurance are improving. The reason that I wanted to share this case study had to do with the importance of clinical thinking that starts from the very first visit when an examination and evaluation happens. Just because a patient is referred with a specific diagnosis does not immediately mean that a correct diagnosis has been determined. This case highlights the clinical thinking that happens when evaluative findings do not match anticipated findings. I knew from my examination and evaluation process that this particular referral would provide helpful information for the profession globally, so I took time to capture photos and video. Another aspect of this case that is important to keep in mind is being an advocate for a patient. In this situation, it meant ensuring a proper diagnosis was found. A patient with a muscular dystrophy kind of problem would have a different prognosis and treatment focus compared to a patient with a peripheral nerve injury. The final reason that I shared this case has to do with the very limited published literature on Parsonage-Turner Syndrome in adolescents. I really had no direction or evidence to help me develop a treatment plan. The treatment plan I created was based on a combination of experience and knowledge I had about how nerves heal. The main factor I had to keep in mind with this patient was his level of fatigue. I had to find that happy medium between strengthening and not over-fatiguing his upper extremity muscles. In sharing this case study, I also believed it was relevant to track the outcomes as the patient progressed. ↑ MacDonald BK, Cockerell OC, Sander JW, Shorvon SD. The incidence and lifetime prevalence of neurological disorders in a prospective community-based study in the . Brain 2000;123:665-76. ↑ Beghi E, Kurland LT, Mulder DW, et al. Brachial plexus neuropathy in the population of Rochester, Minnesota, 1970–1981. Ann Neurol. 1985: 18:320–323. ↑ van Alfen N. The neuralgic amyotrophy consultation. J Neurol 2007;254:695-704. Abdo, W. F., Bloem, B. R., Eijk, J. J., Geurts, A. C., Alfen, Nens van, & Warrenburg, B. P. C. van de. (2009). Atypical dystonic shoulder movements following neuralgic amyotrophy. Movement Disorders: Official Journal of the Movement Disorder Society, 24(2), 293-296. doi: 10.1002/mds.22398. Alfen, N van, Schuuring, J., Engelen, B G van, Rotteveel, J. J., & Gabreëls, F. J. (2000). Idiopathic neuralgic amyotrophy in children. A distinct phenotype compared to the adult form. Neuropediatrics, 31(6), 328-332. Retrieved July 1, 2009, from http://www.ncbi.nlm.nih.gov/pubmed/11508556. Alfen, N. van. (2006). The trouble with neuralgic amyotrophy. Practical Neurology, 6(5), 298-307. doi: 10.1136/jnnp.2006.101261. Alfen, Nens van. (2007). The neuralgic amyotrophy consultation. Journal of neurology, 254(6), 695-704. doi: 10.1007/s00415-006-0246-4. Alfen, Nens van, & Engelen, Baziel G M van. (2006). The clinical spectrum of neuralgic amyotrophy in 246 cases. Brain: A Journal of Neurology, 129(Pt 2), 438-450. doi: 10.1093/brain/awh722. Alfen, Nens van, Huisman, W. J., Overeem, S., Engelen, B G M van, & Zwarts, M. J. (2009). Sensory nerve conduction studies in neuralgic amyotrophy. American journal of physical medicine & rehabilitation / Association of Academic Physiatrists, 88(11), 941-6. doi: 10.1097/PHM.0b013e3181a5b980. Alfen, Nens van, Werf, S. P. van der, & Engelen, Baziel G van. (2009). Long-term pain, fatigue, and impairment in neuralgic amyotrophy. Archives of Physical Medicine and Rehabilitation, 90(3), 435-439. doi: 10.1016/j.apmr.2008.08.216. Charles, L. M., & Jayam-Trouth, A. (1980). Brachial plexus neuropathy. Three cases in children. American Journal of Diseases of Children (1960), 134(3), 299-300. Retrieved July 1, 2009, from http://www.ncbi.nlm.nih.gov/pubmed/6244729. Conway, R. R. (2008). Neuralgic amyotrophy: uncommon but not rare. Medicine, 105(2), 168-169. Retrieved July 1, 2009, from http://www.ncbi.nlm.nih.gov/pubmed/18453198. Devathasan, G., & Tong, H. I. (1980). Neuralgic amyotrophy: criteria for diagnosis and a clinical with electromyographic study of 21 cases. Australian and Journal of Medicine, 10(2), 188-191. Retrieved July 1, 2009, from http://www.ncbi.nlm.nih.gov/pubmed/6930211. Eijk, J. J. J. van, Alfen, Nens van, Berrevoets, M., Wilt, G. J. van der, Pillen, S., & Engelen, Baziel G M van. (2009). Evaluation of prednisone treatment in the acute phase of neuralgic amyotrophy: An observational study. Journal of Neurology, Neurosurgery, and Psychiatry. doi: 10.1136/jnnp.2008.163386. Feinberg, J. H., Doward, D. a, & Gonsalves, A. (2007). Cervical radiculopathy vs Parsonage-Turner syndrome: a case report. HSS journal : the musculoskeletal journal of Hospital for Special Surgery, 3(1), 106-11. doi: 10.1007/s11420-006-9028-x. Finstad, K., Guajardo, J. R., & Scoville, C. (2008). Neuralgic amyotrophy associated with antibiotic therapy. The Annals of Pharmacotherapy, 42(9), 1344-1347. doi: 10.1345/aph.1L185. Fong, F., & Illahi, M. (2009). Neuralgic amyotrophy associated with hepatitis E virus. Clinical Neurology and Neurosurgery, 111(2), 193-195. doi: 10.1016/j.clineuro.2008.09.005. , A., Sasaki, M., Sugai, K., & Tojo, M. (2006). [Case of 12-year-old boy with idiopathic recurrent neuralgic amyotrophy]. No to Hattatsu. Brain and Development, 38(5), 369-372. Retrieved July 1, 2009, from http://www.ncbi.nlm.nih.gov/pubmed/16986739. Gourie-Devi, M., & Nalini, a. (2003). Long-term follow-up of 44 patients with brachial monomelic amyotrophy. Acta neurologica Scandinavica, 107(3), 215-20. Retrieved from http://www.ncbi.nlm.nih.gov/pubmed/12614316. Hannibal, M. C., Ruzzo, E. K., Miller, L. R., Betz, B., Buchan, J. G., Knutzen, D. M., et al. (2009). SEPT9 gene sequencing analysis reveals recurrent mutations in hereditary neuralgic amyotrophy. Neurology, 72(20), 1755-1759. doi: 10.1212/WNL.0b013e3181a609e3. Hoque, R., Schwendimann, R. N., Kelley, R. E., Bien-Willner, R., & Sivakumar, K. (2008). Painful brachial plexopathies in SEPT9 mutations: adverse outcome related to comorbid states. Journal of Clinical Neuromuscular Disease, 9(4), 379-384. doi: 10.1097/CND.0b013e318166ee89. Hussey, A. J., OʼBrien, C. P., & Regan, P. J. (2007). Parsonage-Turner syndrome-case report and literature review. Hand (), 2(4), 218-221. doi: 10.1007/s11552-007-9059-x. Høst, C., & Skov, L. (2006). [Idiopathic brachial neuritis in a 12-year-old boy]. Ugeskrift for Laeger, 168(45), 3920-3921. Retrieved July 1, 2009, from http://www.ncbi.nlm.nih.gov/pubmed/17118258. Iyer, S. (2009). Denouement and discussion. Parsonage-Turner Syndrome. Arch Pediatr Adolesc Med, 163(3), 276. Retrieved from http://www.ncbi.nlm.nih.gov/pubmed/11529813. Likhachev, S. A., Ponomareva, E. N., Gavrilina, T. V., & Astapovich, A. A. (1991). [A differentiated approach to the therapy of the Parsonage-Turner syndrome]. Zhurnal Nevropatologii I Psikhiatrii Imeni S.S. Korsakova (Moscow, Russia: 1952), 91(3), 35-37. Retrieved July 1, 2009, from http://www.ncbi.nlm.nih.gov/pubmed/1646535. Martínez-Salio, A., Porta-Etessam, J., Berbel, A., Alonso, A., Gutiérrez-Rivas, E., & Trueba, J. (1998). [Amyotrophic neuralgia: review of 37 cases]. Revista De Neurologia, 27(159), 823-826. Retrieved July 1, 2009, from http://www.ncbi.nlm.nih.gov/pubmed/9859159. Miller, J. D., Pruitt, S., & McDonald, T. J. (2000). Acute brachial plexus neuritis: an uncommon cause of shoulder pain. American Family Physician, 62(9), 2067-2072. Retrieved July 1, 2009, from http://www.ncbi.nlm.nih.gov/pubmed/11087188. Misamore, G. W., & Lehman, D. E. (1996). Parsonage-Turner syndrome (acute brachial neuritis). The Journal of Bone and Joint Surgery. American Volume, 78(9), 1405-1408. Retrieved July 1, 2009, from http://www.ncbi.nlm.nih.gov/pubmed/8816659. Ngo, T., & Doughty, C. (2010). Progressive unilateral arm weakness in a 7-year-old boy. Pediatric emergency care, 26(9), 676-7. doi: 10.1097/PEC.0b013e3181f054e6. Patel, M., Mahajan, A., & Desai, S. (1990). Neuralgic amyotrophy: a long term follow-up of four cases. Journal of Postgraduate Medicine, 36(2), 112-114. Retrieved July 1, 2009, from http://www.ncbi.nlm.nih.gov/pubmed/2097366. Rubin, (2001). Neuralgic amyotrophy: clinical features and diagnostic evaluation. The neurologist, 7(6), 350-6. Retrieved from http://www.ncbi.nlm.nih.gov/pubmed/12803665. Santana, L., & Gutierrez, A. (2009). Neuralgic amyotrophy. Current Treatment Options in Neurology, 11(2), 85-89. Retrieved July 1, 2009, from http://www.ncbi.nlm.nih.gov/pubmed/19210910. Sathasivam, S., Lecky, B., Manohar, R., & Selvan, a. (2008). Neuralgic amyotrophy. The Journal of bone and joint surgery. British volume, 90(5), 550-3. doi: 10.1302/0301-620X.90B5.20411. Serratrice, G., Baudoin, D., Pouget, J., Blin, O., & Guieu, R. (1992). [Typical and atypical forms of neuralgic amyotrophy of the shoulder: 86 cases]. Revue Neurologique, 148(1), 47-50. Retrieved July 1, 2009, from http://www.ncbi.nlm.nih.gov/pubmed/1604113. Wendling, D., Sevrin, P., Bouchaud-Chabot, A., Chabroux, A., Toussirot, E., Bardin, T., et al. (2009). Parsonage-Turner syndrome revealing Lyme borreliosis. Joint, Bone, Spine: Revue Du Rhumatisme, 76(2), 202-204. doi: 10.1016/j.jbspin.2008.07.013.